Why do graduates wear a cap and gown? What do hoods and tassel colors represent? What symbols are used and why? Learn about Augsburg University’s academic attire and commencement ceremony traditions. The academic dress worn today has its roots in the 12th and 13th centuries when most scholars were clerics in monastic orders. Today’s doctoral robe is based on monastic robes; the hood, originally a cowl, was used to keep the head warm before indoor heating. Robes were formerly all black, but now institutions choose their own colors, and all official doctoral robes have three velvet stripes along bell-shaped sleeves. Today, advanced degree candidates and professors wear either an Oxford cap (square mortarboard) or a Cambridge cap (decorative, beret-like caps). 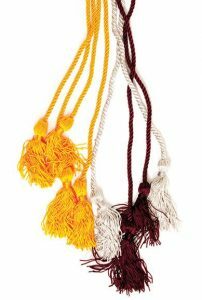 There is no official color for bachelor’s degree tassels, so Augsburg graduates wear tassels of maroon and gray—the school colors. 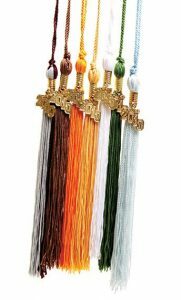 Tassels for graduate students are different. In 1895, the Intercollegiate Commission was established to standardize academic dress and to prescribe specific colors to represent different fields of study. Augsburg graduate program students and faculty wear the colors of their fields. Like tassels, the hoods given to master’s degree students have specific meaning. The main color of the 3 ½-foot hoods is black, and they are lined with the colors of the university conferring the degree. The hood’s trimmings are three inches wide and correspond to the field of study. For example, a master’s hood given by Augsburg University would be maroon and gray with apricot to represent the field of nursing. 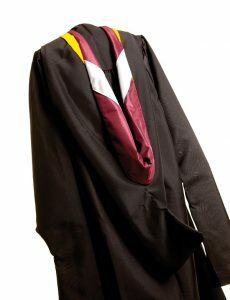 This robe and hood belong to Augsburg’s Director of Academic Administration Nathan Hallanger. The four-foot doctoral hood is scarlet with blue trim, signifying a Ph.D. from the Graduate Theological Union in Berkeley. A variety of colored cords and stoles appear on students’ shoulders at commencement. Two cords are officially given by Augsburg to undergraduate students. Students who have earned a GPA of 3.6 or higher are candidates for Latin honors, shown by maroon and gray cords. All students who have completed the requirements of the Augsburg University Honors Program wear gold cords. Other cords indicate the student’s membership in a national or international honor society. 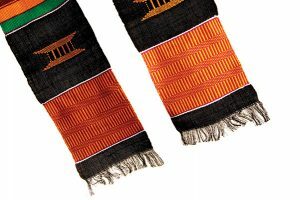 Some students wear cords or stoles of different colors, which represent affiliation with various communities and programs. For example, the colorful stoles worn by African-American students are made from a material called Kente cloth, which originates in Ghana, West Africa. The cloth was woven by the Asante people of Ghana and was made exclusively for Asante kings and queens. Now the stoles are given to members of the Pan-Afrikan Student Union as a way to denote their fraternity and to connect them with their past. 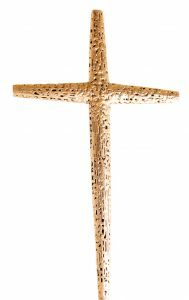 In 1988, Professor Emeritus Norman Holen created the cross used in chapel and carried in Augsburg ceremonies. The processional cross is a sign that Augsburg University is rooted in its Lutheran Christian identity. Because of this institutional identity, Augsburg values excellence in the liberal arts, respect and love for one’s neighbor, creativity in the arts and sciences, and freedom of inquiry. All of these values are critical in shaping informed citizens, thoughtful stewards, critical thinkers, and responsible leaders. Augsburg University graduates are called and empowered to serve their neighbors so all may flourish. The mace, like academic regalia, originated in the Middle Ages. 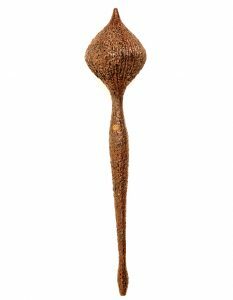 First used by medieval European bishops who were not allowed to carry swords into battle, the mace was useful as an armor-splitting weapon. By the 16th century, the mace was converted into a symbol of authority and was embraced by colleges and universities as a ceremonial icon. At Augsburg, the mace is carried into all official university ceremonies by the president of the Faculty Senate. Professor Emeritus Norman Holen created Augsburg’s mace in 1970, which was laid on a table during events until 1988, when Holen was commissioned to create a stand for it. 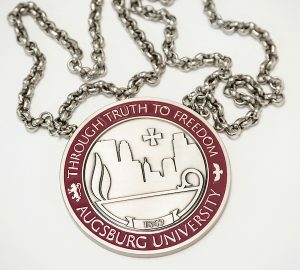 Augsburg University’s Chain of Office represents the president’s authority to head the university and is worn by President Pribbenow at ceremonial functions such as commencement. The chain suspends a medal imprinted with the university seal. The Augsburg seal is based on a design by Paul L. Konsterlie ’50 that was created to celebrate Augsburg’s centennial in 1969. In addition to incorporating the name “Augsburg University” into the seal, staff designers Denielle Stepka ’11 and Mark Chamberlain restored key elements of the original seal, including symbols of a lion that reflects Norwegian heritage, an eagle representing the United States, the Minneapolis skyline, and the lamp of knowledge. As with the central graphic elements, the motto “Through Truth to Freedom” was retained. 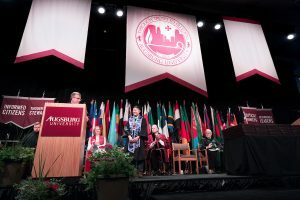 Flags displayed at commencement represent sovereign nations of American Indian students and countries of the international students graduating in the ceremony. Augsburg University is located on land originally inhabited by people of the Dakota and Anishinaabe nations. 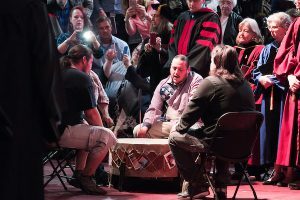 In recognition of that past, and of all the indigenous peoples across North America, the university includes an honor song in commencement to recognize and honor all graduates. The honor song is performed by Red Bone, a local American Indian drum group comprised of singers from the Ho-Chunk, Lakota, and Ojibwe nations. They are a group of professionals who came together as singers, role models, and mentors to improve conditions for youth in the Twin Cities American Indian community.